Where there’s smoke, there’s sometimes fire… or a flat tire. When your tire is so flat that the rim is grinding against the road, the friction will cause smoke. As if we needed to tell you this, smoke coming from your car is a strong indicator that you should pull over as soon as possible. Ideally, you should get off the highway, but if that isn’t an option you should stop where the shoulder is wide enough. Mechanic Matt has some good roadside safety tips, including the importance of setting out flares even in broad daylight. Once you are safely pulled over, go ahead and put on your spare if you know how to change your tire. If you don’t, just call a local towing company. If you are far from home, Yelp is a great way to find the most reliable services in the area. If repair shops are open, the tow truck can likely bring you straight in to get your tire fixed. If you are driving yourself, or if it’s late at night, you will need to drive for a bit on your spare. 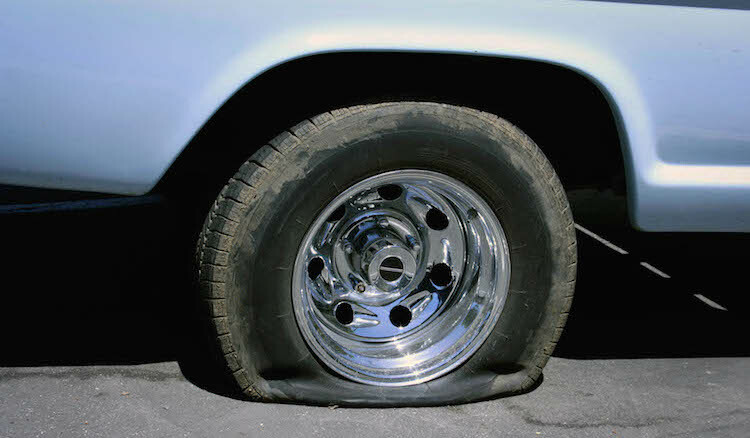 Since your spare is not as robust as your primary tires, you will have to drive more cautiously. Tire manufacturers typically suggest that shouldn’t drive more than 50 miles on your spare and never go above 50 mph because it has less traction and is more likely to blow out. Typically your mechanic will be able to patch your flat and get you back on the road without putting a big dent in your pockets. However, if the damage wears through the tire wall, you will need to purchase an entirely new tire. No need to worry – your mechanic can usually sell this to you – or you can visit a site like Tire Rack. It is important to note that not all tires are created equal, so make sure you are purchasing the right model and for the right location (sometimes front tires can be different than rear tires). Buying online is often less expensive, and you can even have the tire shipped directly to the installer so you don’t have to lug it around. We hope that these tips will ensure a smooth road in the unfortunate event that you do get a flat. If you are a Metromile insurance customer and elected to have roadside assistance in your plan, you will be covered 24/7. And if you aren’t currently a per-mile insurance customer, you could really save some money if you are a low-mileage driver. Get started at metromile.com/insurance.